My first novel, Generation V, was published in 2013 from ROC Books, and is a work of urban fantasy. Its sequel, Iron Night, was published January 7, 2014. The third book in the series is Tainted Blood and will be published on November 4, 2014 — and is now available for pre-order! I hold an advanced degree in the humanities, and I am an adjunct professor at several New England colleges. I am currently hard at work on the fourth Fortitude Scott book. You can check out my full list of books at my Amazon Author Page. I have to admit, I jumped the first two books and got straight to book 3 here. Although I didn't read them, I was able to make it through Tainted Blood just fine. I did feel as though I missed a lot of the back story... well all of the backstory but I was able to read through and enjoy right where I was. I met Fort and learned about the business and LOVED the take on it. 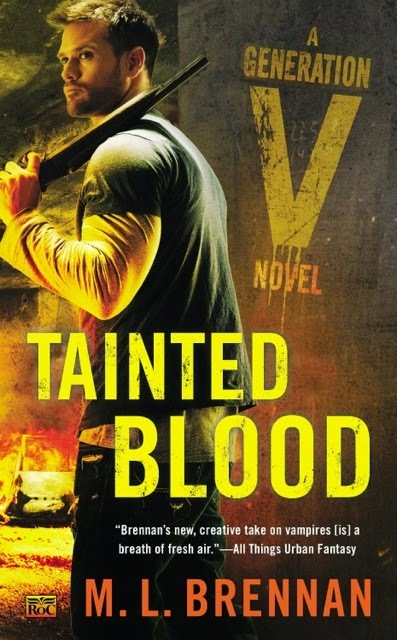 Tainted Blood has pretty much everything you want and more in an "other" book. I really liked the take on elves and weres, I am totally going back and reading the first two now! This is a fast paced story with a lot of detail and it just builds and builds.. I know there has to be a fourth!! Oh where oh where can my winning be, I guess the world really hates me!